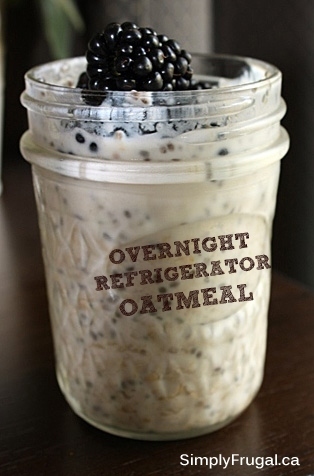 Here’s a recipe for one of my new favourite breakfasts, Overnight Refrigerator Oatmeal! It’s really versatile so you can change it many ways to suit your tastes! Not only are these refrigerator oatmeal jars quite filling and packed with a ton of nutrition, they’re delicious as well! While chia seeds don’t add any flavour (making them super versatile), I just really love the texture they add to the oatmeal. They should last quite a few days in the refrigerator without fresh fruit added. 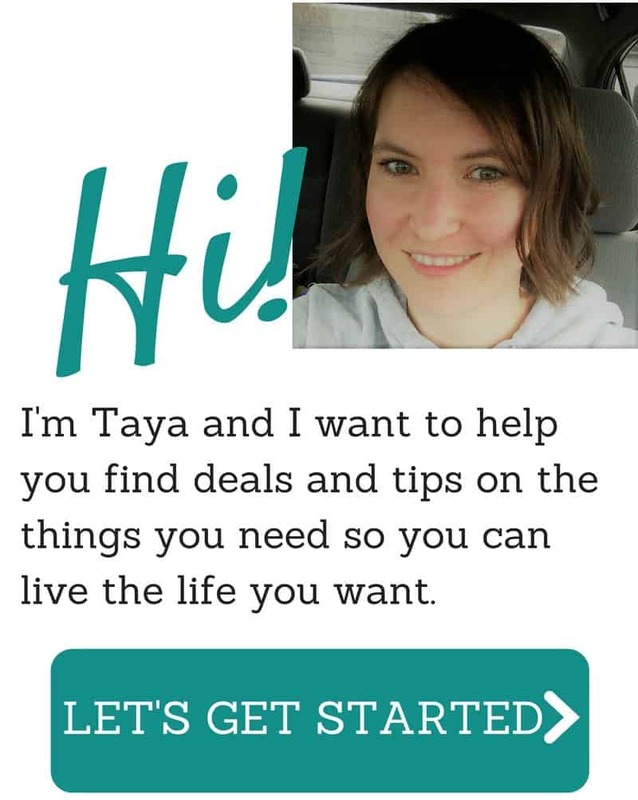 I like to make two at a time, but it would be really great to make a week’s worth! My personal favourite way to make this is with brown sugar and fresh berries (whatever I have on hand) Grapes are also delicious. I’m sure if you add some cut up apple and cinnamon, you’d have a tasty concoction! Or how about some peanut butter and bananas? The options are endless. Stir up, then place in the refrigerator covered, to eat the next morning. Add fresh fruit just before you eat. Menu Plan Monday…on a Tuesday? How much sweetener do I need? How about honey? Would a tsp. be too much? You would add sweetener to your personal taste. Honey would be yummy! The recipe says “11/5 tsp chia seeds. Typo? It sounds more like a muesli, using the yoghurt. You could do the same with milk and that would be re-heatable. @Lynda – have you tried the crockpot oatmeals? That might be a better option for your hubby than the refrigerated kind. Thank you so much for this recipe – this oatmeal rocks! My husband and I have been eating it for breakfast over the past week and i just made a huge batch (using Vanilla Greek yogurt) for the upcoming week! I love the versatility – last week we mixed with peanut butter and bananas (YUMMY!) and this week we’ve picked up some blueberries and blackberries to try. The only thing I haven’t tried yet is the chia seed…is this something that can be purchased in a regular grocery store? Would you be able to use flax seed instead of the chia seeds? I have a whole bag of ground flax seed that needs to be used. Yes! Flax seeds would work well in this! Enjoy! I use Flax seeds in my salads. Just throw a tablespoon on before eating. Love it. Love this idea? Do you think it could be done with steel cut oats? Eating it as we speak! It reminds me of the yogurt that we used to buy that had the granola mixed in. It’s yummy and VERY filling! And the chia is a MUST! Adds a little pop and no weird flavour. Made it. Eating it now. Love it. I used Vanilla greek yogurt so no extra sweetness required. I always have at least 2T Chia a day so this is great! I will add a chopped apple when I take this for breakfast to work. So glad you liked it! The vanilla yogurt is brilliant, actually I have used regular (not greek) yogurt in the past. Tried this. Sorry…didn’t like it. Tasted somehow “uncooked” to me. How many days can i keep them this way (mixed)? I would say to use the expiry date on the milk and yogurt as a guide line. Although if you mix in the fruit at the same time as everything else, I’d say a few days. This looks so delicious & healthy – thanks for sharing the recipe, I’ll definitely be making this! Lynda, instead of your husband buying the oatmeal prepackaged, why dont you buy good quality, organic bulk & he can repackage in ziploc or in a container & add sugar. Should be way cheaper then the little packages. I will check out the organic store. Thank you for your help. He does like it sweet, and he adds those little creamers to it because he says that people at work will take your food from the fridge if it is not tied down. I’ve seen other recipes where they portion out the oatmeal with powdered milk and then whatever sweetner you like so that you can then take that to work and add hot water to get the same thing – but cheaper version – of the packaged oatmeal. Will it be OK to leave out chia in term of taste? It would be totally fine to leave out the chia seeds! But, I don’t find the seeds have a taste and add a great gel-like texture (almost like tapioca maybe?). They tend to take on the flavours they’re put with. My husband eats store bought oatmeal at work every day. He starts very early and does not eat breakfast at home. Could this Refrigerator Oatmeal be put in a plastic container, soaked overnight and then heated in the microwave in the morning at work? He could add the chopped fruit, peaches are his favourite, afterwards. And I think that this would be much cheaper then two pkgs. a day that he has been having. Hi Lynda, this oatmeal is meant to be eaten cold, so I’m not sure what warming up the yogurt in the recipe would be like. If you think it’s possible to heat up yogurt, then by all means give it a go! Thank you for the link. I much prefer you option with the yogurt. I just made yogurt today and granola. My husband would not like the yogurt so I was trying to think of a much cheaper way for him to eat his oatmeal. He buys it even when it is not on sale. And only purchases the expensive brand. Lynda, when I used to work, I used to make my oatmeal the night before. 1/3 cup oatmeal, 1/3 cup water or milk, let it sit overnight in the fridge, and heat it up in the morning, or at work! This worked great for me! Sometimes, if not all the time, I would add 2 tbsp. Of egg white in the mixture, if I had it handy! Thank you Anita I would try it. I hope he will. I love oatmeal. And it would be just as easy for him to do it your way, and cheaper. I have been talking to him about being frugal for a long time. This would be a cheaper alternative to the prepackaged oatmeal which contains a lot of sugar, salt and added chemicals.